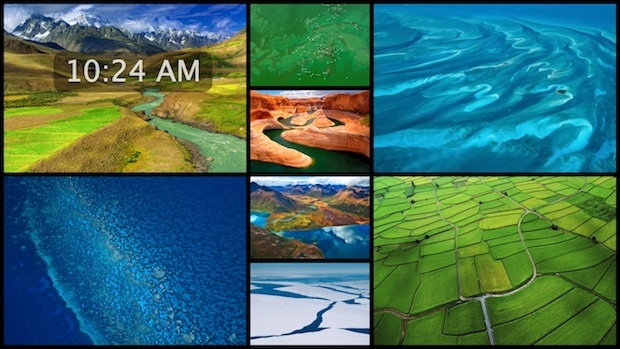 The new screen savers are basically picture slideshows of some amazing photography in four themes: National Geographic, Aerial, Cosmos, and Nature Patterns. Combine those with the fourteen new slideshow types: Floating, Flip-up, Reflections, Origami, Shifting Tiles, Sliding Panels, Photo Mobile, Holiday Mobile, Photo Wall, Snapshots, Vintage Prints, Scrapbook, Ken Burns, and Classic, and you have 56 new screensaver possibilities. Preview the screen savers full screen by selecting one then clicking in the thumbnail pane. Ken Burns is the most subtle and probably the best if you want to enjoy the pictures, but the other choices like Shifting Tiles are fun too, particularly with iPhoto libraries and personal pictures. 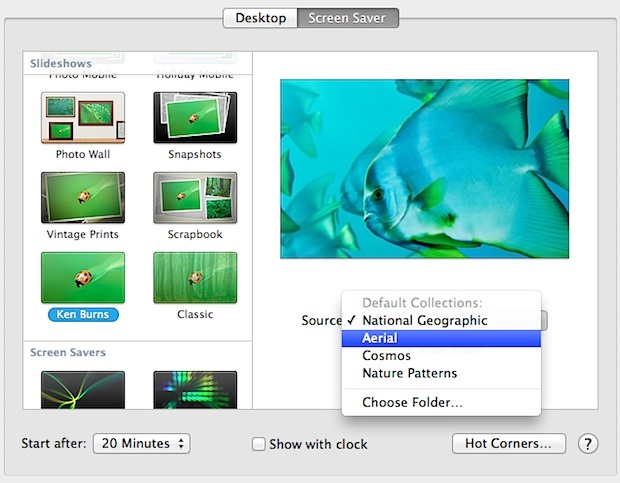 Also worth mentioning, you can still make your own by selecting any specified folder as the screensavers image source, but in Mountain Lion you can no longer select a stream from Flickr or RSS like you could in prior versions of Mac OS X – bummer. Thank you. These screen savers are a welcome addition to the previous ones. I had some really great screen savers – one was rippling water over the desktop. Another was a PURE black screen (yes, I know I can change my desktop to black but it still leaves the menu bar). Too many restrictions going on here. As an Apple user since 1983, I am very disappointed with the direction things are going. I also know there isn’t anything better. I don’t like an OS that does everything but wipe my okolee. BTW, I do like the screen saver. I just wish I could use my old ones, too. Where are the files located for these preinstalled slideshows? I seen a couple that I would like to have as my desktop. I too would love to use some of them as my desktop. Where are those files located? We’ll dig them up, stay tuned! Here, you have the 4 Sources that appear on the Screen Saver Preference Pane. And for the little “trick” you can add images to one of these default sources and the new pictures will be used when this source is chosen. I’d like to be able to use my photostream as a source for my Mac screensavers. Anyone have any ideas on how to pull that off? Hey everybody! Does anyone know where that amazing canyon is? I can’t seem to find any information about it. I assume you meant where on the planet, not in your file system. @David, I’ve seen an archive with all the photos posted for download here: .